Chelsea could be prepared to sanction the sale of Eden Hazard in the summer, should any suitor come up with a transfer package of around £100m. The Belgian has just 18 months remaining on his existing deal with the west London giants and so far, there has been no progress in terms of a contract extension with the Blues. Due to this, there has been the ever-increasing speculation regarding his future with the Blues and The Telegraph reports that the club may sanction his departure in the summer. Still, they are unlikely to do the same on the cheap and reports indicate that the Blues could stick with the Belgian for the final year of his deal, should his £100m valuation not be matched. 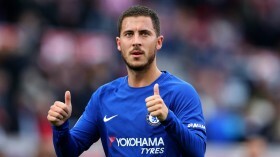 Hazard has flirted with the idea of joining Real Madrid over the past six months and it appears that the Blues are already preparing for his probable exit with Christian Pulisic signed from Borussia Dortmund. The United States international joined the Blues in a £58m deal earlier in the month but he has since returned to Dortmund on loan for the remainder of the season.